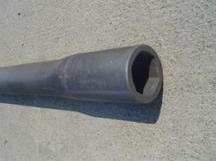 Auger Tube forgings are used in a variety of earth exploration applications. Earth exploration assemblies are used to gather earth samples for mining and testing purposes in environmental, mineral exploration and construction industries. 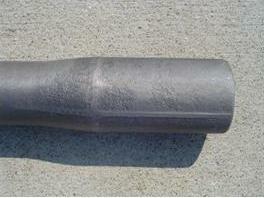 Auger Tube forgings are typically manufactured from solid steel tube. The ends of the tube are then formed into the desired mating shape corresponding to the device to be fitted into. Tubing usually has a square or hex shape that is forging into the tube creating a solid forged steel area that is able to be fit into the assembly. Certain applications call for these ends to be forged as opposed to welded. The forging process creates a single grain flow that runs through the length of the part. Due to the stresses that able to be absorbed by the forging of this component, this process is favoured over castings of similar nature. Auger Tube forgings can then be heat treated and sandblasted after the forging process in order to achieve the desired appearance and the desire steel hardness. 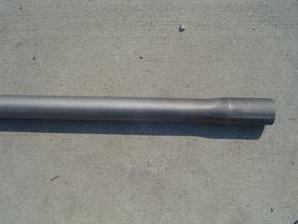 Tubes are usually sheared or sawed on the ends to create a uniform surface on the unforged end. We have dies available for some standard head shapes and configurations. Please send us a copy of your drawing and we will be happy to review your part and send a quote to you. KDK has produce auger tube forgings for over 20 years. KDK produces this product for leading companies in this industry. KDK Forgings delivers consistent Auger Tube Forgings that are used in a variety of earth exploration applications. KDK Auger Tube forgings are used in the following industries: construction, earth exploration.